This film is the very definition of psychotronic. A weird wonderful mind scrabbling WTF sort of film that mashes up genres with wild abandon. Many films have tried to do this but few have actually succeeded in making a film that is watchable never mind as much fun. The plot of the film is very basic. The evil dead Dr Halder is resurrected by his evil assistant. The plan is to get revenge on Santo the masked wrestler who defeated him. 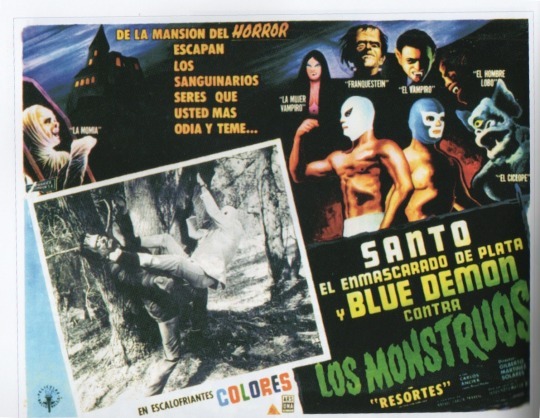 Using an army of monsters (Frankenstein’s creature, vampires, a cyclops, ect)and an altered Blue Demon (Santo’s best friend) Halder sets out to kill Santo and take over the world. Lots of wrestling sequences give way to fight scenes only pausing briefly for alleged exposition and a full on dance number (it’s in a nightclub) in a film that pure motion and eye candy. There is little real exposition. I’ve seen the film four or five times now and I couldn’t tell you much beyond the basics because the film doesn’t tell us much. Plot isn’t required here since the motion and costumes keep us interested and chuckling. Somewhere lower than low rent this film has the look and feel of a film made for about five bucks before being repossessed. The dance number was obviously lifted from somewhere else, either another film or from a stage performance. I suspect it was added to make the film look like it had a budget. If the actors weren’t professional this would have been intolerable, but their glee at playing the script for maximum effect makes this an absolute delight. I love this film a great deal. So much so that over the last few weeks I keep reaching for the DVD to cleanse the mind of all stress.